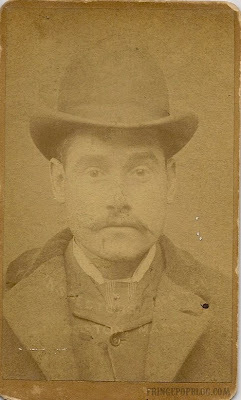 FringePop: Mugshot of Victorian Criminal "Tony Lee"
This is an antique CDV from the mid-1870's of a man wearing a hat. What's interesting about the photo is the backside. 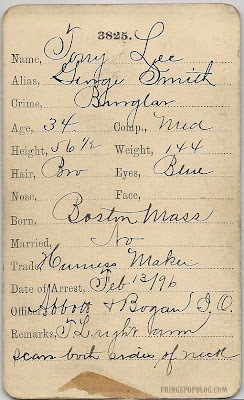 On the back are criminal profile details of the man pictured. He was "Tony Lee," but he went by the alias "George Smith." He was a Boston area burglar, 34 years old, and unmarried. I don't know exactly how this photo was used by the police, but I can only assume that this was a file photo mugshot. Criminals looked much classier then. Nick Nolte's mugshot says it all.